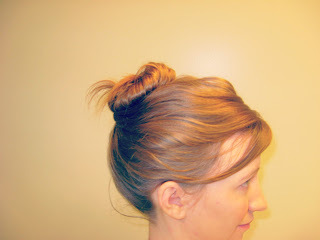 So I was pinning and blog stalking yesterday, and among the stalkage that was going on I found a bun called a top knot that was super cute that I actually liked! Back up....I am not a huge fan of buns. To me they are for ballet or dance or something like that. Some people totally pull them off, other people I'm all...ehhhhh better not. But after seeing this, I had to try it. And I gotta say, I really like it! Plus....after sleeping on it, it left me with the cutest waves and curls in my hair! 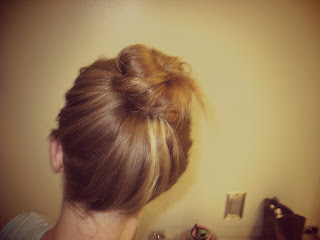 I would TOTALLY recommend this top knot. How to achieve this top knot? It's seriously so easy I almost cried. You pull your hair back into a slick tight pony-tail, but don't put the elastic around it. Then you begin twisting your hair into a coil until it starts wrapping around itself. You let it wrap around itself until you have the end left, then you just tuck the end through the middle and pull it tight! SO EASY right?